TechHire brings together diverse stakeholders to train nontraditional and under-represented groups for tech careers. Through an innovative partnership model that supports lead partner organizations in different cities across the US, TechHire leads a joint effort between private companies, tech skills training providers, and community groups with the aim of providing under-represented individuals with the skills needed to apply for tech jobs. The private companies make a pledge to ”hire based on skills, not pedigree” when evaluating program candidates. Lead partner organizations ensure these individuals receive training, and the TechHire team coordinates cross-national efforts. TechHire was launched out of the White House in 2015, but is now run by Opportunity@Work, a nonprofit with a mission to expand access to career opportunities for all Americans. under-represented, or non-traditional groups face when applying for tech jobs. For example, most tech job postings require a four-year degree, although many of the skills necessary for the work can be acquired in other ways. 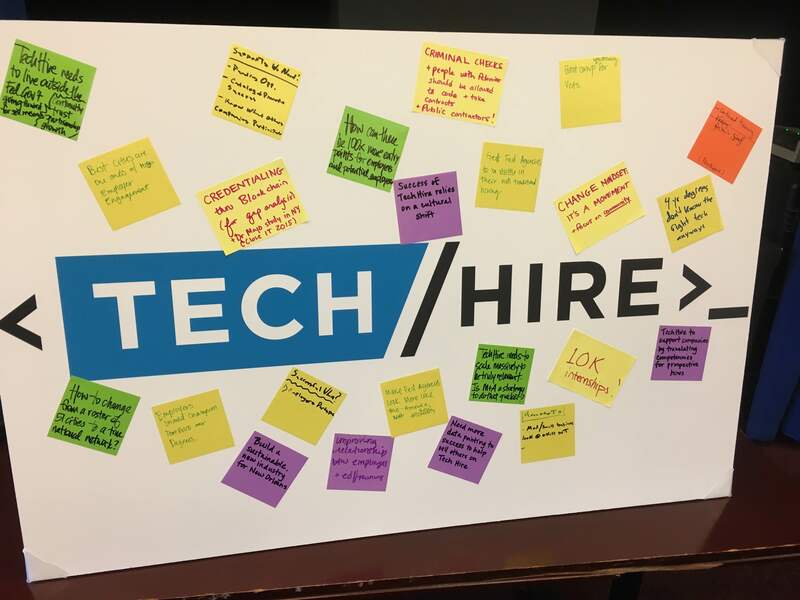 TechHire leverages existing capacity by bringing together diverse stakeholders such as municipal governments, coding training organizations, private corporations and community organizations serving low-income and minority groups in new and unique ways. TechHire thus bridges the gap between employers and employees in the tech sector, creating value for all stakeholders involved. TechHire also convenes private businesses to learn from one another and share best practices on retaining diverse tech talent. By drawing on companies’ success stories, TechHire works to change the narrative around talent in tech. TechHire has grown to a network of 237 training partners and 1,300 employers, in 72 communities across the US. Over its first year, TechHire helped 4,000+ people find jobs. TechHire has substantial plans for expansion through; I) increasing the number of individuals being trained; II) ensuring retention and promotion of these individuals after they have been hired; III) expanding its reach to new cities, and IV) developing an online marketplace to drive scale and inclusion across TechHire communities. Opportunity@Work is currently developing a new financing model that will allow lowincome individuals with the aptitude and motivation to enroll in high quality tech training. The talent equity fund vehicle will be piloted in 2017 with partners to prepare for wider 2018 rollout.